The Gypsy Girl is a beautiful small puzzle that the company Fernand Nathan published in 1973. The name of Fernand Nathan still appeared in the boxes of Nathan puzzles manufactured in the 70’s. It was a publishing company that Fernand Nathan started in 1881 and continued to be a family business until 1979. After that, the name Nathan remained, but the company passed to other hands. We tend to repeat too often that past times were better. However, this is quite true with regards to the choices that jigsaw puzzle companies are making these days when they select their images for their catalogs. For that reason, it is so refreshing to find these old little gems. It seems that Nathan had much better taste 40 years ago than today. Frans Hals was a master of portrait. For that reason, it is no surprise that this portrait is a masterpiece. Hals was a master of the technique of painting with a visible brushstroke (something previously seen as a flaw). Vincent van Gogh admired his technique, and in the 19th century, many artists would follow it, particularly among the Impressionists. So, we can say that Hals introduced in the 17th century a refreshing innovation. His style was bold and very unconventional for the public of his time. Although he didn’t leave any followers, he was very influential two centuries later. Although Hals painted many portraits of grave personages, and meetings of brotherhoods or societies, he was also fond of painting the rubicund faces of drinkers and the open faces of hostel servants. This painting is refreshing because Hals captures a joyful, healthy and alive woman. However, there is another reason to find this puzzle refreshing: the cut of the pieces. I have never seen such a variety in the piece cut in a jigsaw puzzle. Most contemporary jigsaw puzzles have a quite standard cut. The pieces are mostly uniform and there is little room for variety. But in this puzzle from 1973 not two pieces are alike, as you can see in the photograph with the close-up. When I verified the puzzle I counted 499 pieces and I realized I would have to put it together to be sure whether it was complete or not. With such piece cut, any number might have been possible. 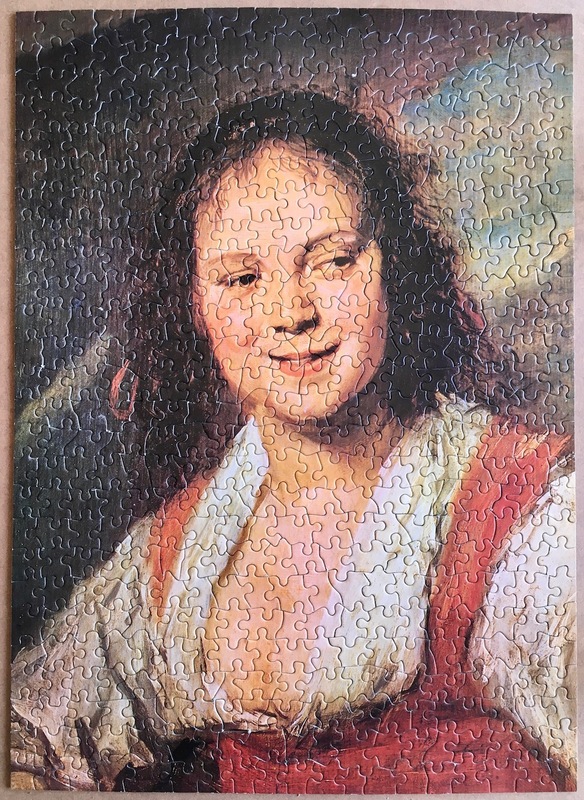 So, putting together a 40 year old puzzle with the pieces in excellent condition due to the good quality, with such variety in the forms of the pieces, and with such beautiful portrait is an absolute and refreshing delight. 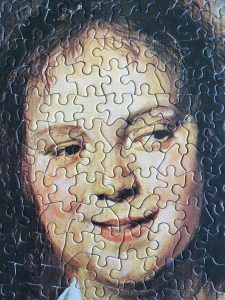 The puzzle appears now for sale in our online store, but it is worth keeping. However, you can always enjoy the original painting at the Louvre Museum. 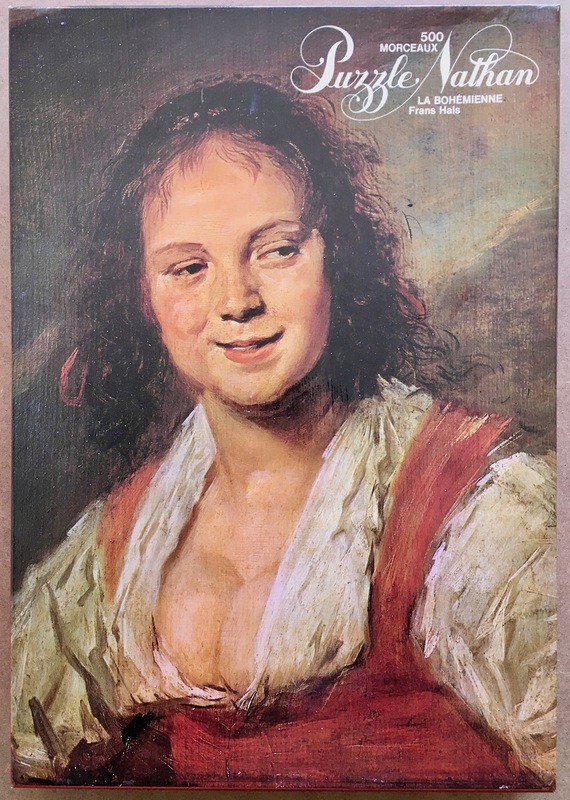 500, Nathan, The Gypsy Girl, by Frans Hals, 49.5 x 36 cm, Reference number 551 111.